Roasted Garlic Jelly | ReLocavore: Redefining "local"
I’m hoping to make something tasty this weekend with a 5-bone rib-in pork roast that has been sleeping in my chest freezer. Somehow the idea of pork and garlic really appealed to me, but so did the idea of honey glazed ham. 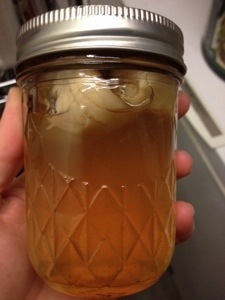 Bringing these two concepts together, I made roast garlic jelly which I will use to baste the pork roast. Unfortunately, what I wanted to make was roasted garlic JAM – with lots of chunks of roasted garlic and a little sweetness. Best-laid plans of mice. I ended up with Jelly instead – wine, vinegar, sugar infused with roast garlic. To make it a bit more interesting, I added the garlic cloves back into the jars, but they floated up to the top and separated from the jelly. I guess I’ll just roast more garlic to use with the pork roast. Categories: Cooking, Putting Food By, Uncategorized | Tags: canning, garlic, garlic clove, jam, jelly, pork, roast pork, roasted garlic | Permalink. I had a garlic-chili jam about two years ago. Their garlic was minced quite finely and stayed in situ with the chili flakes and herbs. I also used it as a pork glaze. Ooh… Minced with chiles? Sounds like a Thai or Asian condiment. It was roasted garlic, so it had a nice nutty richness to it. Could you share your recipe? It sounds positively lovely!